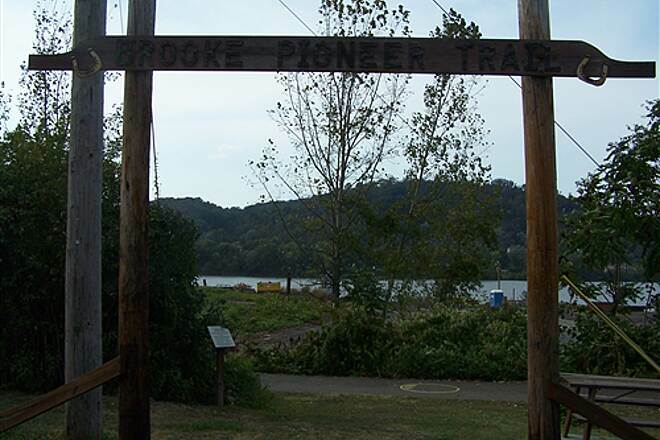 The Brooke Pioneer Trail follows the east bank of the Ohio River between Wellsburg and the Brooke–Ohio County line at Short Creek. 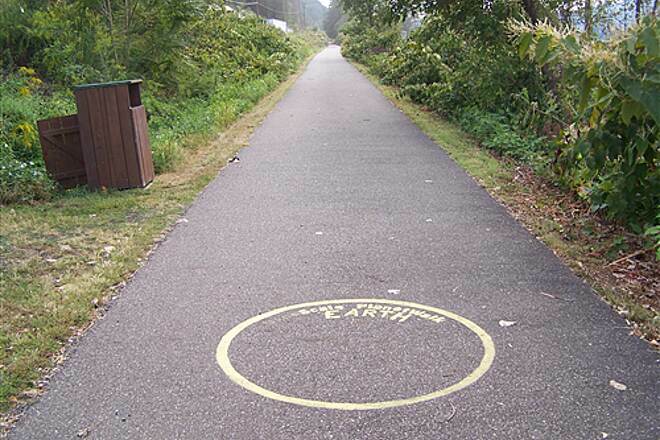 Here the Brooke Pioneer Trail continues into Ohio County as the Wheeling Heritage Trails. 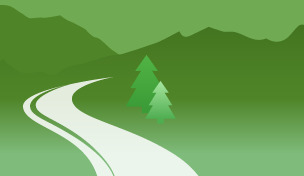 Both trails are paved and provide a total of 18 miles of scenic hiking or biking along the river between the two cities they connect. 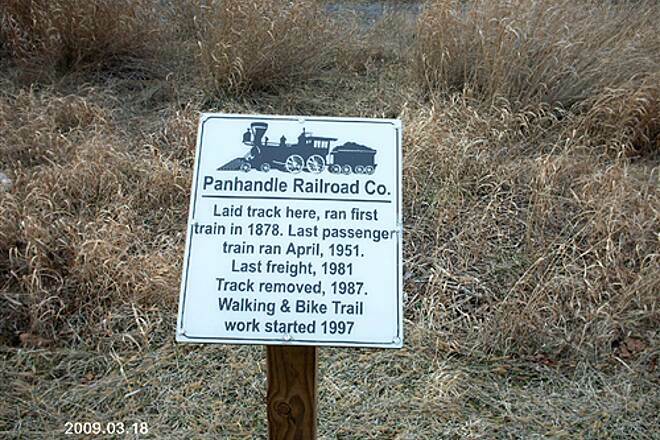 You'll find expansive interpretive signs along the way that describe the railroad history—the Panhandle Railroad—of this area. Once called the "Wheeling Secondary Track" between Weirton Junction Tower and Benwood, West Virginia, the line opened in 1878. 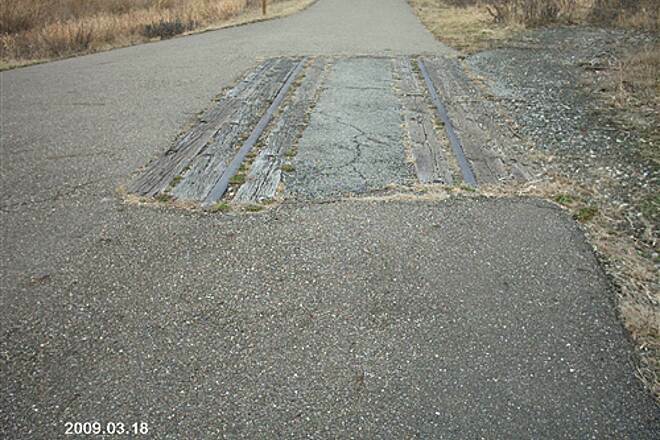 Serving freight (until 1981) and passengers (until 1951), the tracks were pulled in 1987, and it would be another decade before trail construction began. 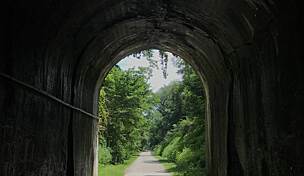 In the north, the Brooke Pioneer Trail begins at a connection with the Wellsburg Yankee Trail, another rail-trail open on the same corridor in the community's downtown. 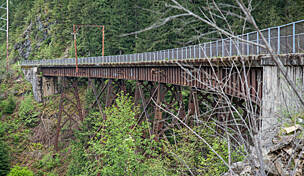 Extending south from Wellsburg, the trail crosses Buffalo Creek on a restored railroad trestle paralleling State Route 2. This is how the route continues for its entire journey: wedged between the road and the Ohio River. That doesn't mean the views are lacking. 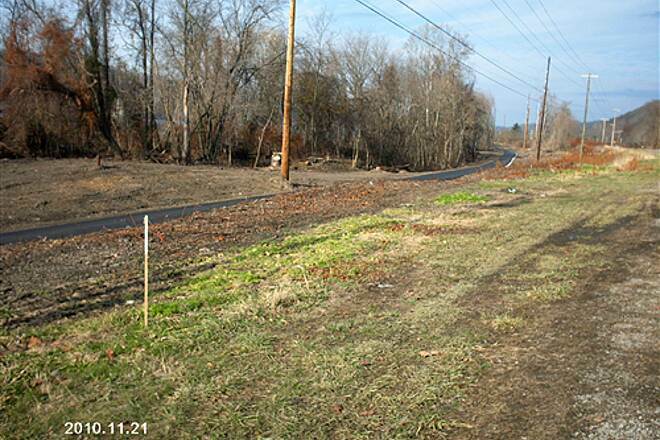 In fact, the road is often shielded from view by brush likely there since the days of the railroad. 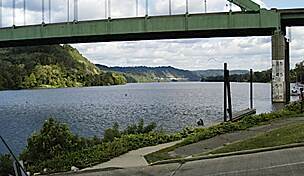 Looking to the west, trail users are treated to stunning vistas of the powerful Ohio River and the dramatic climbs and drops of the hills in Ohio just beyond. Those looking for reminders of the area's industrial past won't be disappointed, either. 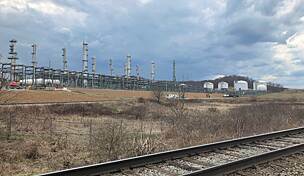 The trail skirts the edge of a handful of manufacturing properties between Wellsburg and Windsor Heights, and the large cooling tower and smokestack of Ohio’s Cardinal Power Plant interrupt the views of the rolling wooded landscape on the opposite shore. In Wellsburg, park just south of the trestle off SR 2 south of town, beside a gas station. Limited parking is also available just off the trail in Beech Bottom. In Windsor Heights, park just south of the bridge off SR 2 at Stone Shannon Road. Use caution when crossing the highway to access the trail. I parked in Wellsburg and biked toward Wheeling since this is the direction I was traveling from. I had a little trouble finding the parking lot and the start of the trail isn't visible from the road. The lot is a sharp left turn into a dirt area and is not well marked. After I got on the trail I noticed locals parked in a gas station a little beyond the trail head. 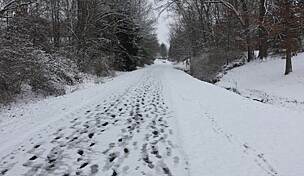 The trail is a pleasant easy ride on asphalt that is tree covered and shaded most of the way. There are nice views of the Ohio River along the way. There is a Porta John at the opposite trail head about 7 miles down the trail. 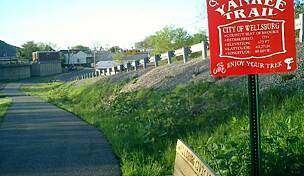 Though the trail ends at about 7 miles it is still paved through Wheeling. This part of the trail runs parallel to a highway but that isn't a big problem it is worth the ride to see the locks. Use caution on the Brook trail there are two sections that have sink holes. 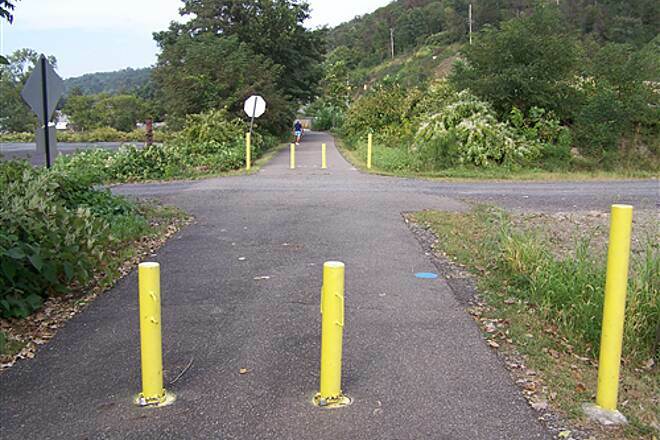 One is very clearly marked but is dangerous to ride through the other is really just a big dip but isn't marked and can sneak up on you. I still recommend the trail for a bike or nice run/walk. Wonderful view of the Ohio River and nicely paved trail. Hubby and I walked it today from Wellsburg, 4 miles out and 4 miles back. 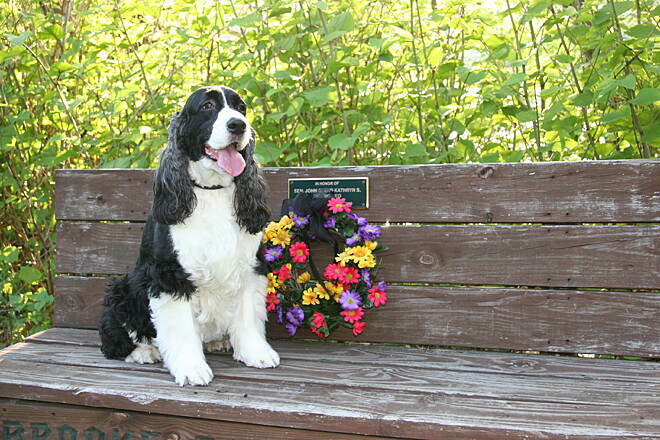 Plenty of benches and historical markers. But, NO PORTAPOTTY OR RESTROOM!!! Kinda ruined it for me! Started at the Pike Island Locks and Dam. 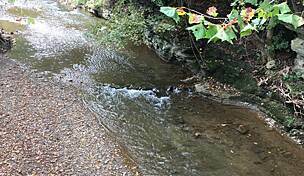 My son and I went north and turned around where the Brooke trail veers around the old Wheeling-Pitt property. The Wheeling side was in good shape (a lot of blown garbage from the nearby roadway). On the Brooke section, plenty of benches, rest stops, and one historical section which was interesting. Well marked, Brooke side had downed trees on path (small ones). Enjoyable day, not bad on bad knees. 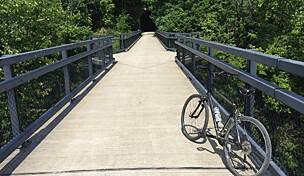 This is a great addition to the Wheeling trail....hopefully they continue to connect it to make even longer trails. I think more people would try biking if we are offered these beautiful trails to ride. 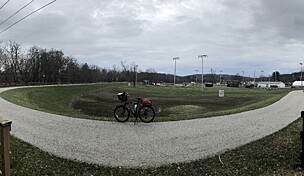 We traveled to the area from eastern PA to ride the Wellsburg Yankee, Brooke Pioneer and Wheeling Heritage Trails. Of the 3 trails, this was the most appealing. The trail had some lovely spots, there was evidence that people were making an effort to beautify the trail in spots and the asphalt was in good shape. I wish that the other trails were as nice. Trail was very well kept. Little chilly today, but still a nice ride. Strong wind coming back from Pike Lock and Dam back to Wellsburg. Overall very nice day. It is a beautiful day and I was in the mood for a new bike trail, so I took Rt. 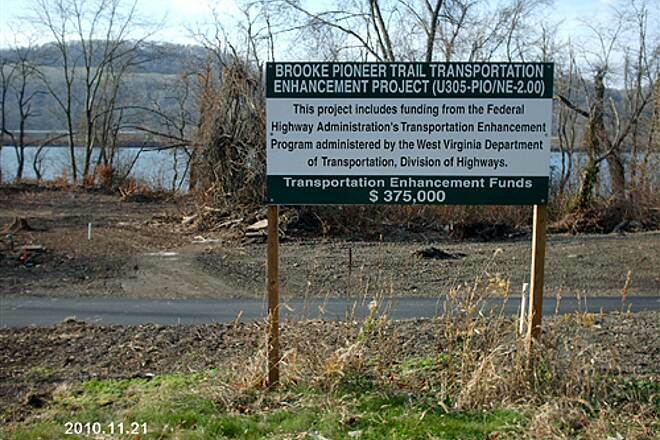 50 out of Bridgeville and hopped on the Brooke Pioneer Trail in Wellsburg. That was a beautiful drive and the trail was also beautiful. The first 5 or so miles are heavily wooded, beautiful scenery, beautiful views of the river. After that it was kind of out in the open, along Rt. 2. I went to just past the lock and dam, then turned around. I would have gone farther, but I was fighting a strong wind! There is an observation deck at the lock if you want to watch. All in all a beautiful, relaxing day! SHOULD BE NAMED "HONEYSUCKLE TRAIL"
May 7, 2011, GREAT NEWS!! Started a ride North from Wheeling Heritage Port and discovered that I could ride all the was to Wellsburg.. 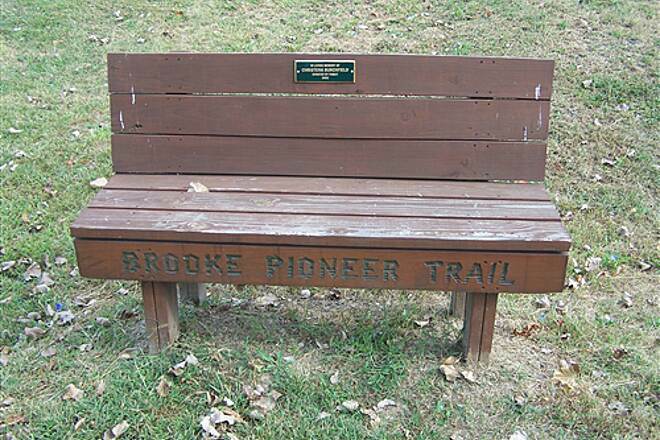 The Brooke Pioneer Trail is now complete. The trail is completely paved and very flat. 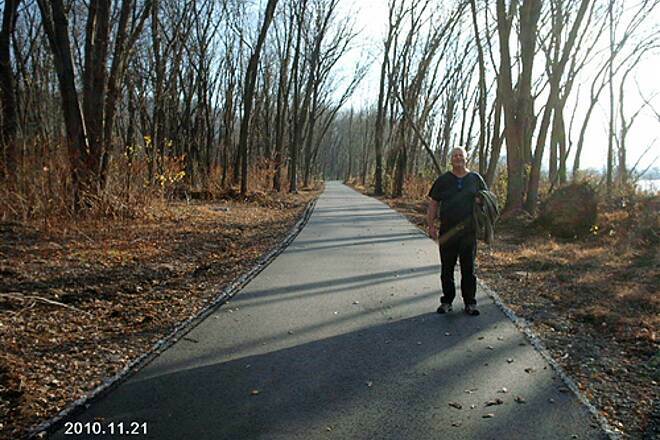 Was there today (Sunday 11/21/2010) and walked a little of the new section that completes this trail. What a good looking smooth flat surface. Seen alot of people enjoying the day here on the trail. Were glad to see this come together and plan to really enjoy it. The trail is about say 6 3/4 miles long now, but links to other trails at each end. I'll save the details for you to discover when you come check it out in person. 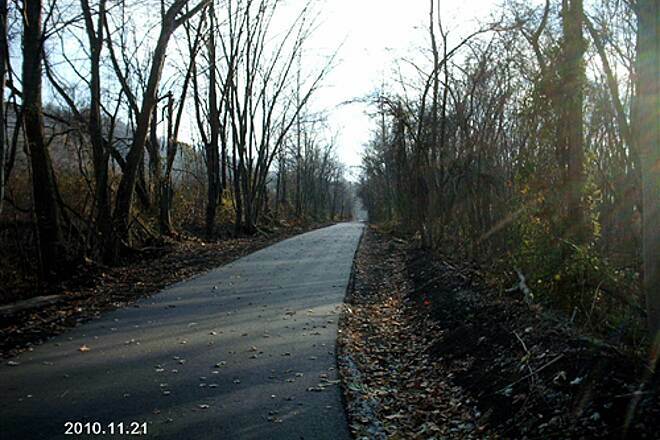 Smooth, flat, paved asphalt rail trail right next to the Ohio River. The northern section has a small parking lot by a gas station south of the city of Wellsburg, WV just off State Rt. 2. 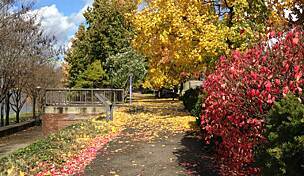 From this parking lot you can go north into the city of Wellsburg via the "Yankee Trail" which starts just over the "Buffalo Creek" bridge. Or you can go south on the Pioneer Trail for around 3 miles. At this point is where you can expect a planned extension to connect the trail to its other end point about another 3 miles ahead. Right now there is a "Gap" there in the trail. Right now you must take State Rt. 2 south the 3 miles thru the town of Beech Bottom to the other end of the "Gap". There the paved trails starts up again. At this point the Pioneer Trails continues another say, short distance to the "Short Creek" bridge where its connects to another paved trail, (Wheeling Heritage Trail) that takes you clear down to the city of "Wheeling" WV. a nice ride. You can find parking at the "Pike Island Dam" off of State Rt. 2 also. Historical signage along the trail. Plenty to see along the river. 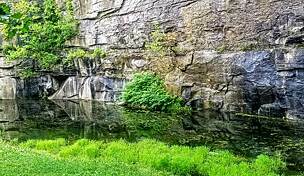 Nice place to relax, Picnic Area along the trail. Park Benches placed every so often to take a rest.